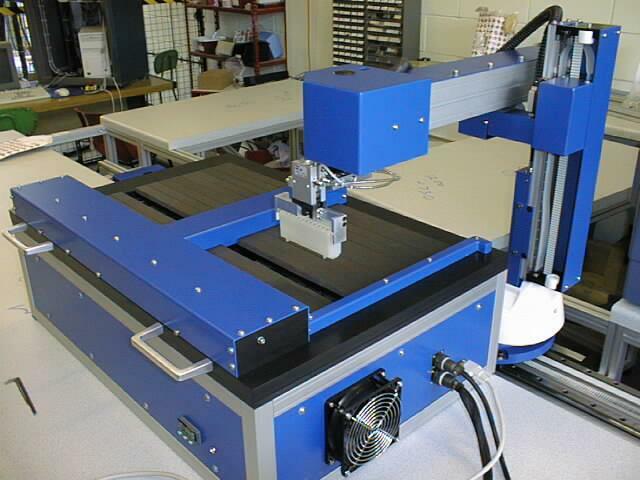 The R14 is a two or three axis Cartesian positioning system designed for highly accurate, repeatable positioning of product under some process. The R14 is, in fact, just a mechanism which may be optionally fitted in any enclosure to suit the application. The picture above shows two-axis R14 positioner manufactured for Peak Analysis & Automation (PAA) as their StorStar product. It positions a titerplate or tube holder under an aperture. All you do is send it a well number and the medium is positioned accordingly. This ensures that sample is entered or taken from the correct well or tube under computer control, eliminating human error or for positioning under a fixed pipette. R14 is small and compact and uses small but powerful stepping motors with lead screw drives. It has a single card controller developed by ST Robotics which uses the same ROBOFORTH commands as it's big brothers R15/17/19. 384 wells are equally easy. EJECT - brings plate/rack out at front of unit. Communication is by RS232 serial (e.g.COM1) or USB (up to COM9) or TCP/IP. Programmable: In addition you can program the device to do anything you want, for example you connect a signal or switch to one of the inputs and program it to increment the well number each time the signal is given. Another application for R14 is this cooling cabinet designed to store reagents at low temperature. Cooled with Peltier devices and intelligent PID controller it can hold 0.1 deg C down to 1 deg C. The R14 is used to open slats in the top of the cabinet to allow access by the transport robot. 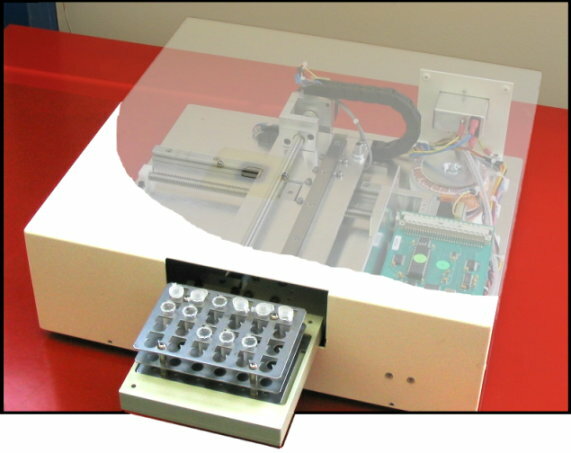 X-Y table as used for titer plates. X-Y-Z version.